Time to get those seedlings sprouting! Spring is beginning to warm up, and it’s time to get your seeds started. Before you start, be sure to keep a record of what you’ve planted, and the progress they’ve made, this will help you next year to remember what works, and how long you will need for each seedling. Make sure to store your seeds in a cool dry place, in small plastic containers. To make sure that your seeds are still viable, take a few and soak them in cool water. If they sink, they’re still plantable, if they float, they’re technically “dead” and won’t sprout. Use plastic containers instead of clay for planting, they will keep moisture better. You can recycle old yogurt containers or other plastic tubs, just make sure you poke holes in the bottoms of them for drainage. Make sure you don’t overcrowd your seeds, tamp them down to make sure that there is contact between your seeds and the moist soil or potting mix that you use, and cover them lightly with more soil. You can maintain air and moisture quality in a few ways. Use a small fan to keep the air circulating, spread some finely ground stone or grit over the potting mix, and cover the containers with plastic. Check your containers daily, and use a spray bottle to add moisture when needed. Keep your seeds warm, between 65 and 75 degrees, by placing them near a heater or using a heating mat. Want to recycle even further? Ben’s dad makes his own heating pads for plants using old waterbed mattresses! 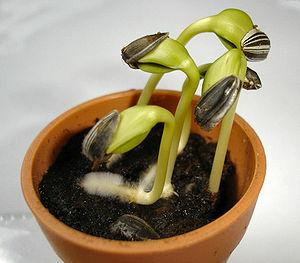 Once your seeds germinate, you can remove the plastic covering. Make sure to rotate your pots daily so that the stems grow uniformly, and gently brush them with your palm to encourage strong stems. Once the leaves begin to emerge, it will be time to feed your seedlings weekly with watered down fertilizer. At this time you should also begin hardening your plants by placing them outside in the sunlight for a few hours in the morning, gradually adding more hours until your plants are acclimated enough to the outside temperatures to be planted. Good luck, and if you need any assistance with your plants this spring, give Algiere’s a call! This entry was posted in Uncategorized and tagged Garden, gardening, landscapers, landscaping, Moisture, orgainc, Plant, Potting soil, Seed, Seedling, Sow, Spray bottle, upcycling on April 5, 2013 by mspetersonexplains. Very nice tutorial on home gardening, including the great tip to test seeds for viability. In Hawaii we basically don’t have to worry too much about seasons, almost everything we garden is perennial.